The campaign to monitize public schools is getting more and more public attention. Journey for Justice, “an alliance of 36 grassroots community, youth, and parent-led organizations in 21 cities across the country” It is working for “community-driven school improvement as an alternative to the privatization and dismantling of public school systems.” Its Coordination Committee includes Detroit’s Keep the Vote, No Takeover. In May 2014, J4J published Racism, School Closures, and Public School Sabotage, a report documenting the movement to close underfunded urban schools. 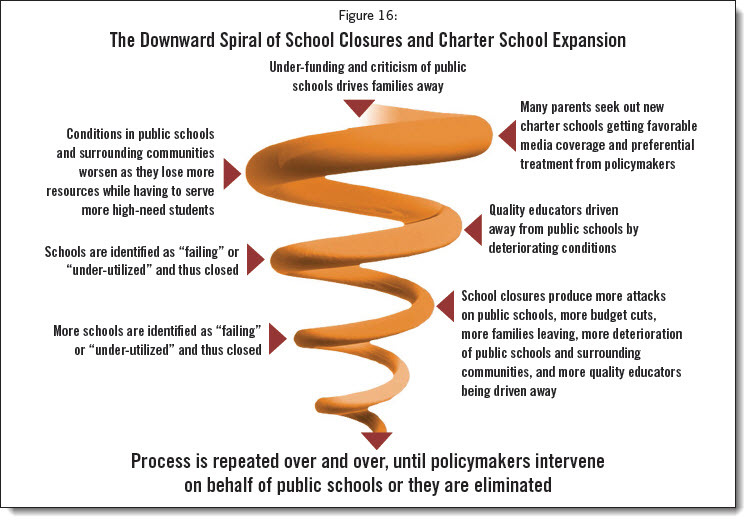 The real, underlying cause for these school closures is that there has been a realignment of political forces. Right-wing conservatives have long sought to eliminate public goods such as public education, and dismantle organized labor, especially teachers’ unions. They have also long pursued the replacement of public schools withnon-unionized, privately managed schools that receive public funds, either through a voucher system or a system of charter schools. Urban Prep Academies in Chicago … dubbed “Hogwarts in the Hood,” recently received national attention for having all of their graduating seniors accepted at four-year colleges or universities, for the fourth consecutive year. … Urban Prep’s Englewood campus had 85 students in their 2011-12 graduating class, there were 178 students who originally started in the class four years earlier. Over time, they lost over half of their students. … During the 2011-12 school year, it expelled 31 out of their 473 students, or one out of every fifteen … Additionally, nearly one out of every 10 of their students elected – or were encouraged – to transfer out of the school, during just that one school year … the school lost over one out of every six students during just one school year. In 2012-13, among the 19 schools with the most expulsions in Chicago, 18 of them were charter schools. Overall, the city’s charter schools had an expulsion rate 12 times higher than that of the city’s public schools. In 2011-12, the expulsion rate in Washington, DC charter schools was 72 times higher than it was at local public schools. A 2011 study of Philadelphia schools found that the expulsion rate for local charter schools was three-and-a-half times higher than it was in public schools. Many New Orleans charter schools have extraordinarily high suspension rates, which have led a group of students and parents to file a Title VI complaint alleging racial discrimination against African-American students. …the KIPP network of charter schools, well known for their strict, military-style atmosphere,50 loses 15% of their students per year, far higher than their surrounding school districts. Public schools continue to be closed nevertheless, resulting in a downward spiral that ends either with a change in policy or the end of public schools. Among the action steps J4J recommends, is a US Senate hearing on the impact of these attack. Which is way, way overdue.